Cacio e pepe (spaghetti with cheese and black pepper) is a classic and has been doing the rounds in the food blogging world for a long time. I’ve always meant to try it, I was in a lunch rut today and so I gave it a go. I used a recipe from Smitten Kitchen with linguine and parmesan instead of spaghetti and pecorino. Cook your pasta al dente, drain but reserve about 1/4 mug full of cooking water. Heat olive oil in a pan til nearly smoking, then add your pasta and water (stand back as the water will splatter!). Cook for 30 seconds then add all but a tiny bit of parmesan and all your pepper, then your butter. Stir to melt butter until a sauce forms. Serve sprinkled with reserved parmesan. It was perfectly simple, and not as dry as I expected. And so completely easy to make. I would say you could add things like herbs or chili but I think the best thing about this is the simplicity. Any more and it becomes something else entirely. I’d definitely like to try this with fresh pasta next time too, i might even make it myself! These cookies are a result of having lots of tiny packets of nuts from the Graze box we receive. I have to admit we eat the interesting things first (korean chili crackers, wasabi peanuts, chili almonds..) and the plain things like macadamia nuts and hazelnuts generally remain unopened. So I make them into cookies! I based this recipe on this one over at Joy the Baker– but replacing the white chocolate with 70% dark and using a mixture of nuts. The best part of this recipe is the browned butter, it gives the cookies a wonderful nutty flavour, which obviously goes with the nuts! 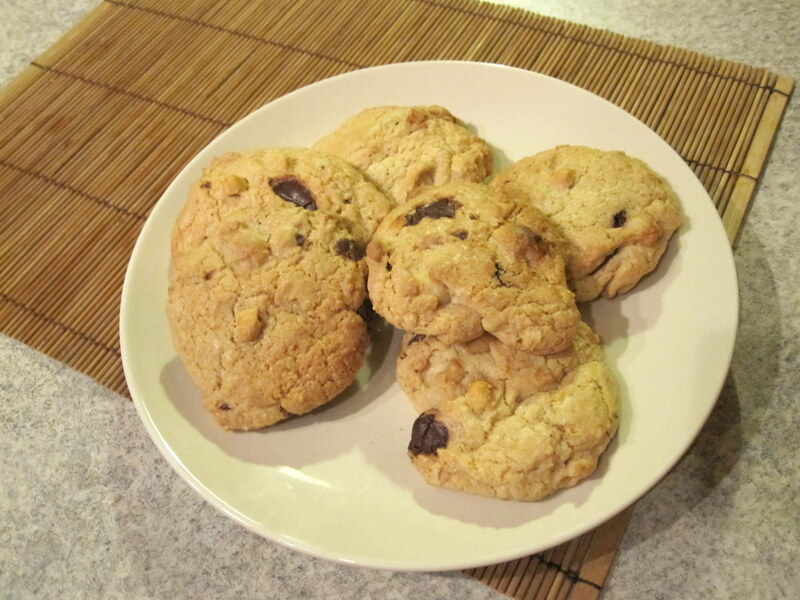 Macadamia, Hazelnut and Chocolate Chip Cookies. Heat your butter on a medium heat in a saucepan, stirring regularly. After about 5 minutes you should see brown bits appearing in the butter, once this happens remove the butter from the heat, leave to cool for a 5 minutes more. Once your butter is cooled add it to your sugar in a large bowl, slowly mixing it in. Then add in your egg and combine. Add milk and vanilla. Then slowly add in your dry ingredients (except nuts and chocolate). Bash up your macadamias and hazelnuts in a freezer bag so that they are coarsely chopped. Chop your chocolate in to medium chunks – however small you like them. Add your nuts and chocolate to the mixture. For large cookies spoon tablespoon ( I made big ones) fulls on to a greased and lined baking sheet, for smaller ones aim for a generous heaped teaspoon. Bake for approx 10 minutes until golden. Leave to cool for a few minutes before transferring to a wire rack. Eat with a lovely frothy coffee or a glass of milk! I’m not much of a lunch person. I never have the time to plan it properly and when the only thing you have access to at work is a sandwich toaster and a microwave. I like lunch when there is time to plan, or when lunch is really just an early dinner. I made this cous cous last week, and it was something that came together so easily, lots of little treats in the fridge all waiting to be eaten, and all going together so well. This feels like it is healthy (you know because its green and it cous cous) but I think the health benefits are questionable. But its light, delicious and just about one of your 5 a day (not that I’m ever counting). First of all make up your cous cous. Use enough boiling water to just cover the cous cous in a bowl, add in a drop of olive oil, stir and cover with a plate whilst you prepare the other ingredients. Mix all the dressing ingredients together so you have a dressing about the consistency of double cream. Add lime and chili to your taste. Once the cous cous is done, season with salt and pepper, fluffy with a fork. 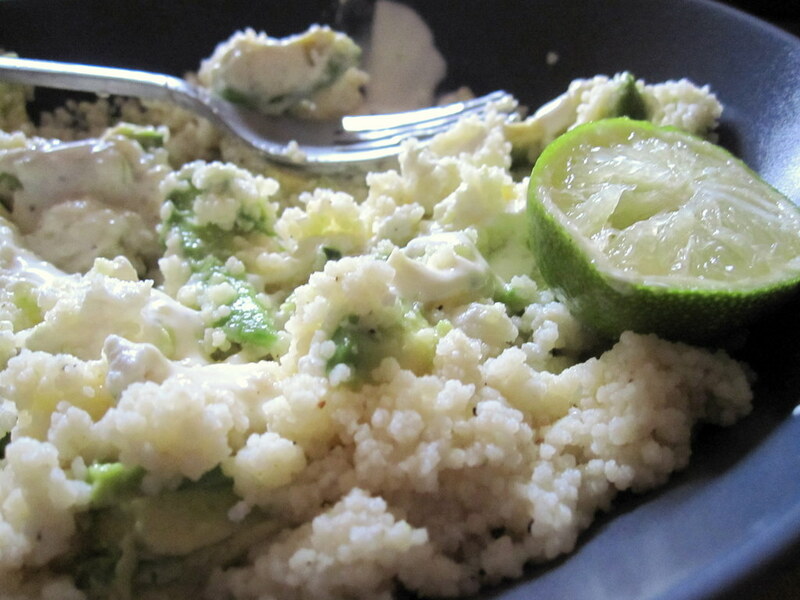 Crumble in your feta, stir in your avocado gently and then top with the dressing and a little black pepper. I had this warm and I thought it was just lovely, if you were to serve it cold I would suggest waiting for the cous cous to completely cool before adding in the rest of the ingredients. Add extra lime to keep your avocado green! I think this would be a great side dish with some grilled fish or chicken too. This is definitely something that is going to become a staple in my house. 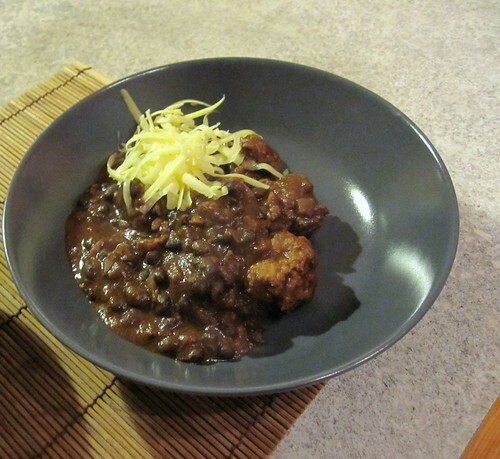 It is wonderful when the weather is cold and one of those recipes that is very easy to put together after a long day. I have used proper chorizo in the past and this works well although I find fresh sausages flavoured with smoked paprika and chili makes for a lovely chorizo-y flavour, and I find the meat much more tender than normal chorizo. If you can find them some supermarkets and good butchers sell chorizo style spiced fresh sausages which save you a bit of time. I have recently discovered the merits of black beans too, I much prefer them to the floury old kidney bean that is normally used. I used canned beans, very easy to find something to do with them in a fix. They are lovely spiced & stuffed into tortillas for enchiladas and added to chili or any kind of stew that needs bulking up. First of all you need to make your sausage meatballs. Meatballs made from sausage meat are great when you are in a hurry, you can use fresh mince and add seasoning, breadcrumbs, eggs etc but I find fresh sausages are great because they are already well seasoned, with a good amount of fat for tenderness and hold their shape very well. Remove your sausages from the casings into a bowl. Add in your smoked paprika, don’t be afraid to add it all, you want your sausages to have that deep chorizo flavour from the paprika. If you have found fresh chorizo style sausages then you don’t need to do this. Shape into meatballs and set aside. Heat up a large saucepan and add olive oil. Fry the onion in olive oil until soft, add the garlic after a few minutes and fry for a minute or so before adding your sausage meatballs. Brown your meatballs for a few minutes. Make sure the heat is up high and everything is sizzling away nicely – add in your wine- be generous, the red wine makes for a beautiful rich sauce. Simmer away the alcohol for about 3-5 minutes, then add in a squirt of tomato puree, your spices, herbs and worcester sauce. Blitz up your chopped or plum tomatoes until they are smooth and add to the pan. Simmer slowly for about 15-20minutes, making sure the sauce doesn’t get too thick – if it does before the meatballs are cooked through then add a little bit of water to keep it going until it is done. Serve with a little grated mature cheddar or soured cream on top and with a nice chunk of fresh bread.